Alongside the Tax Disc and SORN betas that we launched in February, we also released an updated version of our Vehicle Enquiry Service. This service lets you find out information about a vehicle such as its Vehicle excise duty rates, fuel type and CO2 emissions. 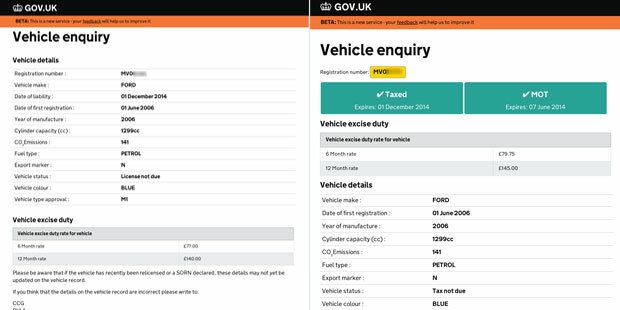 As we've looked at our data, we've noticed that lots of users are trying to find out if a vehicle is taxed. So we've made this information clearer and put it right at the top of the page along with the expiry date. Where we have it, we're now showing the MOT status of the vehicle as well. We'll keep monitoring how people use the service and make improvements where we can. Our colleague Natalie will also be writing about the other work going on in the vehicle enquiry space soon. Thanks for the feedback & glad you like the service. We don't currently have an API for the data, but it's one of the things we're considering adding in a future development. It would be great if you can open up an API to this data source. Doesn't have to be anything complicated. We give VRM, and get back a JSON with car data. You can check if a vehicle is insured by going to http://ownvehicle.askmid.com and search using the vehicle registration number. We have an Expense management software, where we ask under the "Duty of Care" functionality information from the employee about their Car Registration details, Licence, MOT, Insurance and tax disc. Employees have to scan copies into the software and these are checked online by our staff. Is there an API (or an API for part of the data), which we can link into, thus reducing this checking work ? DVLA are looking into the feasibility of developing an API for vehicle data. Once more information and a timeframe is available, we'll communicate via our usual channels.